At P&G, we fully embrace the notion of bringing 100% of who you are, both professionally and personally, to work every day. We know that when our colleagues feel comfortable in their environment, their ideas can make a lasting impact on each other, on our customers, and on our family of brands. Our GABLE (Gay, Ally, Bisexual, and Lesbian Employees) affinity group is one of our three globally recognized affinity groups, with a goal of creating an inclusive environment where LGBT employees feel valued, accepted, and able to perform at their peak. Established in 1996 as an affinity network, our commitment to supporting our GABLE colleagues has deep roots. We work hard to shine light on the inclusivity and support for one another that truly makes P&G a special place to work. 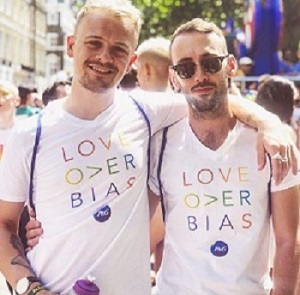 LGBT rights are human rights, and we’re proud to welcome humans of all backgrounds. Our commitment to our LGBT colleagues and consumers is felt and supported internally and externally. 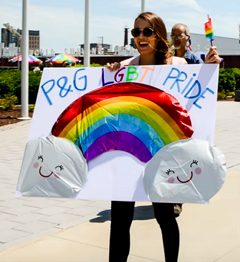 You’ll find us taking a stand for equality, marching as an LGBT community alongside our P&G Allies, supporters, and teammates. We take pride in standing together for what we believe is fair, and know that our employees reflect the fantastic diversity of background, thought, and preference of our customers. I joined P&G as a Brand Management and Marketing Scholar for Head & Shoulders and Herbal Essences. I am involved in maintaining the equity of our brand across all channels. At P&G, I was trusted to handle big responsibilities from Day One. I was the leader of end-to-end projects, and really got to know my brand by analyzing its data and shipping information. 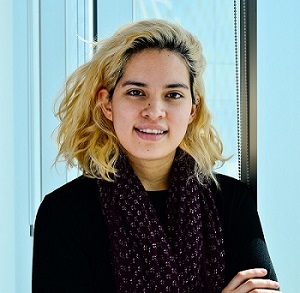 “I BELIEVE THAT NO ONE SHOULD EVER HAVE TO CHOOSE BETWEEN A CAREER THEY LOVE AND THE OPPORTUNITY TO LIVE THEIR LIFE WITH INTEGRITY AND AUTHENTICITY." When researching companies as a member of LGBTQ+ community, I wanted to find an organization who cared as much about their social footprint and voice as they did their performance. I was thrilled when I found an opportunity at P&G, and I joined in early 2017. In 1992, P&G took a public stand for inclusion by adding sexual orientation or our non-discrimination policies. Eleven years later, we marched as a team in our first PRIDE parade. Today and every day, our employees feel the power of working in a supportive environment that allows everyone to be 100% of who they are. Our 10,000+ LGTB employees are further supported by our growing group of Allies. Together, we create a positive and inclusive environment for all employees to bring their true selves to work.